Second, in his first job at The Gap in high school, he found that no job was ever going to be easy. That’s why they call it “work.” So at an early age, he realized the importance of career planning before entering the workforce after college. True to form, fresh out of university he became a management consultant, worked in startups, and started his own venture in China. 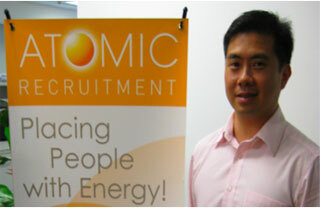 At the same time, his wife Lina Li and a business partner started Atomic Recruitment in Shanghai in 2005. In 2008, Jeff sold his company, completed his MBA, and joined Atomic. Atomic, a recruitment agency that places mid- to senior-level Chinese talent into multinational companies in China, employs forty-five people and has offices in Shanghai and Beijing. Since coming onboard, Jeff has taken over the business development, marketing, and HR operations from his wife (who has since switched careers), doubled the number of clients, and instituted a level of professionalism that distinguishes Atomic from competitors. Because Atomic’s clients are foreign multinational corporations, they expect and demand a very high level of service. Jeff and his partners know how to meet and exceed the expectations that many domestic operations can’t match. Atomic that also separates themselves from the pack by their use of technology. Even back when they had fifteen or so employees, the firm invested in their future by building up their technical infrastructure to a level that you might find at a 100-person recruiting company. Consequently, Atomic’s CRM and databases are very robust and flexible enough to scale their support to even a hundred more personnel. Another advantage that Atomic Recruitment has over other firms is a culture that fosters a family-like environment, one in which employees feel comfortable enough to stay instead of looking for other opportunities in a market that is replete with options. To Jeff, running Atomic like a family business means maintaining strong ethics and creating trust with the staff through fairness, transparency, and inclusion. At Atomic, a big board lists and stack-ranks everyone’s name and sales numbers. So there is no hiding and no hidden agendas. On the other side of the coin, every quarter starts with a kickoff that honors high achievers, top billers, and staff who hit their targets. They give away five to ten awards during this celebration. They have even taken a company trip to Hainan Island, China’s tropical beach resort, after hitting a company stretch goal. Many businesses have goals for their staff and rigidly stick with them despite changes in macroeconomic conditions. At Atomic, Jeff adjusts employees’ quarterly bonuses every quarter depending on the economy and how a person is performing. Since 80 percent of employee compensation is commissions, these additional bonus-based goals are variable in order to keep employees motivated and challenged without being daunting. To get people integrated and acclimated to Atomic’s culture, each new hire is assigned a buddy who introduces the new hire to everyone else. This buddy is also the new hire’s go-to person for questions about the company’s operations and policies. They don’t discriminate based on role: the buddy system applies for interns as well as management consultants. Jeff Hu realizes that offering a transparent career path is one key to keeping talented staff members. This includes mentoring as well as taking a personal interest in their career goals (such as providing support to get into a Master’s program). He spends a lot of time balancing the goals of each staff member while aligning them with Atomic’s goals. Like many companies, Atomic has a mission and cultural values. And like many companies, these points are expressed in a memo and then mothballed: even the executives can’t recite them. Jeff feels that Atomic’s cultural values are trapped in their brochures and not fully communicated to the company. One strategy would be to spotlight and agree upon the values. There is some push and pull between Jeff and his business partner, who has a more traditionally Chinese view that too much time spent on communication and reviews takes away from the bottom line, while Jeff is focusing on retention. At Atomic, they have a good motto: “Placing people with energy.” I think that once the vision, mission, and values are evangelized (which Jeff was on the cusp of re-initiating at the time of this interview), Atomic’s culture as a competitive advantage will only strengthen. At one point, Atomic initiated policy changes specifically to target the actions of one or two people. Everyone in the company knew that the changes were meant to address these individuals’ behaviors. Upon reflection, Jeff doesn’t think it was a good business or cultural decision, and in hindsight would have addressed the situation directly with the individuals without affecting the other 95 percent of the company. I wholeheartedly agree. I’ve been guilty of tweaking company policy to police one or a handful of abusers. It was obvious to everyone why we made the change and whom the change targeted. But unfortunately the non-abusers were being punished, too. Moving forward, I want to create a culture of high accountability where people hold themselves accountable to each other. If I have to discipline someone, then the conversation will probably focus on their long term fit with the culture we’re trying to create and jealously protect. Atomic has hired an outside consultant to create a fair and comfortable environment for their executives to communicate transparently amongst themselves. In Jeff’s mind, the next step is to take the process to another level by having the coach conduct a 360 review for each executive. This then creates a nonthreatening forum to discuss how the executives can improve individually and as a team. Transforming a company culture—as we know from listening to all of these executives trying to do it—takes time, and it starts with buy-in from top management. Then, mid-level managers are more committed to forward-thinking practices, and the whole company is in sync. I think Jeff Hu’s parents would be proud that their son took their life lessons to heart, and now “leads by sharing” at Atomic. I think that recruitment can be a very transactional, numbers-based, “what have you done for me lately?” type of business. So it pleased me to see that with Jeff’s deft touch and influence, Atomic is incorporating sustainable and hard-to-copy advantages such as professionalism, transparency, and culture that endears the company to their clients and candidates. As Atomic continues to flourish, I think that the next evolution of the company will be for management to grow with their executive coach, and set their culture free.